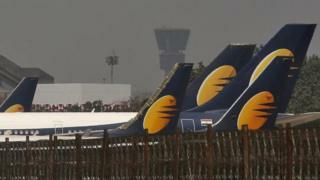 Troubled Indian airline Jet Airways has suspended all its domestic and international flights after failing to find fresh funding. It said it had no choice but to suspend the flights, but said the move was temporary. The airline has $1.2bn (£900m) and has been in talks with lenders for weeks. The Indian government had asked state-run banks to step in with a bailout plan for the airline which employs 23,000 people and was founded by Naresh Goyal more than 25 years ago. The airline had earlier said it was working to “minimise guest inconvenience” by using its contact centres and social media teams, the spokesperson said.